With a strong mix of ocean, wind and marine microorganisms, scientists found that marine life is responsible for half of the summer cloud droplets over the Southern Ocean. Results: How clouds form and how they help set the temperature of Earth are two of the big remaining questions in climate research. Now, a study of clouds over the world's remotest ocean shows that ocean life is responsible for up to half the cloud droplets that pop in and out of existence during summer. A team of scientists led by Pacific Northwest National Laboratory atmospheric researcher Dr. Susannah Burrows and collaborator Daniel McCoy, who studies clouds and climate at the University of Washington, reveal how tiny natural particles given off by marine organisms—airborne droplets and solid particles called aerosols—nearly double cloud droplet numbers in the summer, which boosts the amount of sunlight reflected back to space. For the first time, this study estimates how much solar energy that equates to over the whole Southern Ocean. 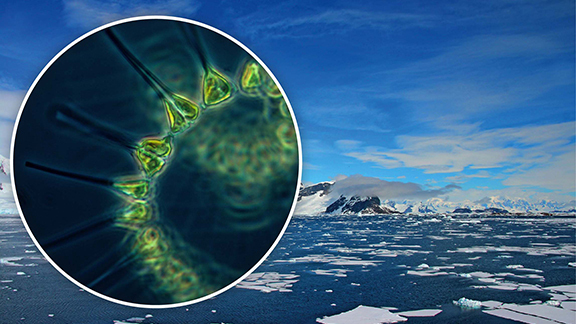 "Phytoplankton in the oceans are a really important source for cloud-droplet-forming aerosols in remote marine air, and we can see the effect they have on clouds is big," said Burrows. Why it Matters: The Southern Ocean’s borders are comprised of the southernmost parts of the Atlantic, Pacific and Indian Oceans, and is one of the cloudiest places on Earth. Important to the Southern Hemisphere's atmospheric and oceanic circulation, understanding Southern Ocean clouds is also important to helping determine how sensitive Earth is to the accumulation of greenhouse gases in its atmosphere. Over land, aerosols arise from vegetative matter, pollution, and dust. Sea spray shoots sea salt—a large source of ocean aerosols—into the atmosphere, but marine organisms also produce aerosols, most of which evaporate into the air. However, studying marine aerosols has been hard because they get overpowered by human-made pollutants in measurements near coastlines. Understanding the amount of energy that clouds over the Southern Ocean reflect might help researchers assess how well climate models are able to capture the effects of these marine particles on clouds. "Southern Ocean clouds play a large role in the global climate, and hopefully this will help us get a better sense of how sensitive the Earth is to greenhouse gases," said Burrows. Methods: The study combines computer modeling with satellite data over the Southern Ocean, the vast sea surrounding Antarctica. To flesh out the role of different aerosols, the PNNL and UW-led team used computer model to simulation of both marine organic matter and sulfates. Sea salt is also an important source of cloud droplet nuclei, and was assumed to contribute a comparatively constant source of particles in this region. In addition, they turned to a new set of satellite measurements of cloud droplets. The team gathered simulated data of the two more variable biogenic aerosols separately, taking sulfate concentrations from a suite of computer models called AeroCom. The organic matter aerosols were trickier, and they used a computer model that simulated the presence of organic matter within sea spray, rather than the aerosols themselves. Sea salt was assumed to contribute to a constant background of aerosols available for cloud condensation. Comparing the concentrations of all three ocean-derived components with satellite measurements of cloud droplets, the researchers developed a new mathematical equation describing how the sulfates and organic matter relate to cloud droplet concentrations. Plugging simulated aerosol data into their new model, the researchers found it recreated the actual cloud droplet data well. What’s Next? 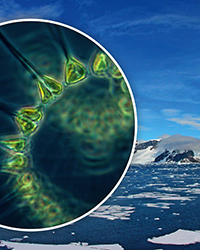 Because it's hard to see the effects of marine aerosols in other parts of the world, the researchers will be able to apply what they've learned about the mechanism and strength of the aerosol interactions with clouds to studies in other regions. Sponsor: The research was supported by the U.S. Department of Energy (DOE) Office of Science Biological and Environmental Research for the Earth System Modeling program; NASA; the U.S. Department of Defense; and the National Science Foundation. Research Team: Susannah M. Burrows, Po-Lun Ma, and Philip J. Rasch at PNNL; Daniel T. McCoy, Robert Wood, and Dennis L. Hartmann at University of Washington; Daniel P. Grosvenor at University of Leeds, UK; Scott M. Elliott at Los Alamos National Laboratory. Reference: McCoy DT, SM Burrows, R Wood, DP Grosvenor, SM Elliott, P-L Ma, PJ Rasch, and DL Hartmann. 2015. “Natural Aerosols Explain Seasonal and Spatial Patterns of Southern Ocean Cloud Albedo.” Science Advances 1(6):E1500157. DOI: 10.1126/sciadv.1500157.